Have you put hours and hours into finding the best dog training collar for small dogs to train your little pup, only to come up short each time? Don’t beat yourself up, many owners of small breeds struggle to find the right way to train their pup, and sometimes extra tools are needed. When you’ve tried every method in the book, a correctional collar can make behavior redirection tremendously less frustrating. At the end of the day you have to find a happy medium for you and your pet, we all just want to bond and share our love with our pups. Instead of spending the day feeling guilty for yelling at your dog when they cut their mouth trying to rip through a window screen, give the collar a try. You might find that you enjoy having your pup around a little more, and that they’re calmer. Does My Small Dog Need A Training Collar? When we hear the words “training collar,” we immediately relate it to punitive action as a way to get our pups to fall in line. However, this couldn’t be further from the truth! Not all dog collars are built on the idea that they need to be distracted through pain. As useful as they may be, not every dog needs a training collar; they’re meant to be a last resort option. If your pup portrays a negative behavior like lunging at the window and breaking glass when someone walks by, they could seriously hurt themselves or someone else. Small dogs with strong prey drive also tend to put their safety at risk by chasing cars or digging through fences to get that pesky squirrel that’s been taunting them. Circumstances like these are definitely appropriate times to use a training collar; at this point your pet is so focused on the moving object that they don’t care about their surroundings or possible hazards. Are Training Collars Safe To Use On Small Dogs? Electronic devices all have the potential to malfunction, but for the most part training collars are plenty safe as long as they’re used correctly. You should still perform some type of test run before placing it on your pet to ensure that it functions properly, and to test the shock level on yourself. Don’t actually place the collar around your neck, simply press it against part of your leg or arm; once the shock becomes too uncomfortable, you can gauge the magnitude from that point. 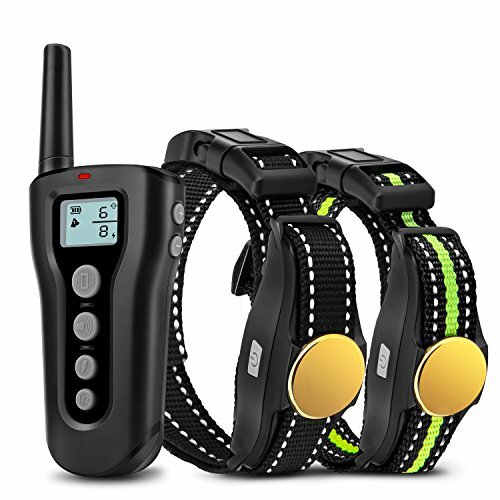 If you use the remote the first time and nothing happens, you may need to pair your devices as this is standard protocol for nearly every small dog training collar. How Does A Training Collar Work On A Small Dog? Most caution signs are just for safety measures, but your best bet would be to assume that the company may have had a negative experience in a past situation and now the warning label has become a requirement. No matter where or who you buy it from, all products have the potential to malfunction; so heed the warnings! To train your small dog with a training collar, watch the video below. What To Look For In The Best Dog Training Collar For Small Dogs? Choosing the right distance for your dog’s collar really depends on how far you want to allow them to go before stopping. Active owners who enjoy off leash runs with their dogs should look for small dog training collars that provide a distance of 1500 feet or more. If you’re worried that might be too much because your pup isn’t quite all the way trained yet, seek out 1000 feet or less. One of the biggest mistakes owners make when trying to find the best training collar for small dogs is not buying the correct size. If you’re in a place like Petsmart and you’re able to, have your pup try it on. A properly fitting collar will be snug, but loose enough to fit two fingers between it and your dog’s neck without a struggle. In this list, we’re mostly covering shock and vibration, but if you’re avidly against the use of them as some owners are, don’t dismay. There are also citronella collars, which eject a light water and lemon scented spray that most canines dislike. There are also options that work strictly on tone alone, emitting a warning beep, then a high pitched sound that is irritating enough to divert their bad behavior. If you’ve got 2 dogs that bark excessively or nip at the heels of your guests, some companies offer remotes that can control the collars separately. Just be careful and make sure you pair the remote with the collars correctly, or else you might end up shocking both dogs by accident. What Is The Best Way To Train A Small Dog With A Training Collar? Familiarize your dog with the training collar, allow them to smell it and get used the feeling. When you place it on their neck, give your dog praise and allow give them a few minutes to adjust; even if they’re used to wearing a collar, the added box device can be irritating and they may try to get it off. Once they’ve adjusted, start training with the tone stimulus only. Then, work your way up to taking them on walks, teaching commands, and basic behavioral adjustment with the vibration. Try to avoid using the shock unless it’s absolutely necessary, most dogs will respond to the tone and vibration though. Results with the Puss and Pooch training collar have been mixed. It would appear that the device works well, but has some serious issues with defects and malfunctioning. With a full charge, it lasts for about 2 to 3 hours, giving you plenty of time for a training session and a walk. 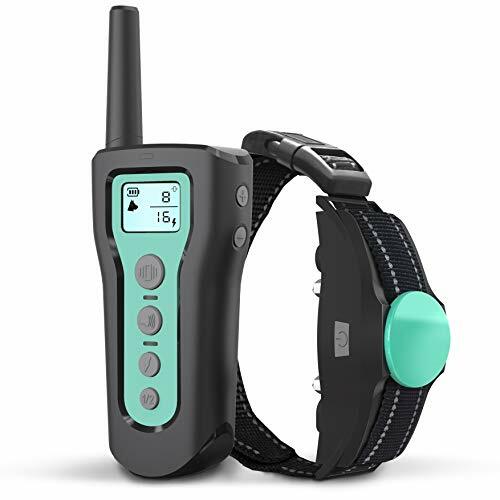 This small dog training collar functions for a few months, but after that timeframe there have been several reports of the remote taking 3 to 4 clicks to work after several uses. Additionally, the level of shock is not consistent, and the involuntary increase can seriously injure a pet. The best case scenario would be for you to be able to go outside and enjoy gardening or playing Frisbee with the confidence that your dog will stay near. Worst case scenario, the clicker doesn’t work on the first try, and your pup runs out into the street and gets hit by a car. While that isn’t a pleasant image, it’s still something to keep in mind. With a conveniently lit LCD screen light, you can even use this collar in the dark! The BESTHING small dog training collar has 8 levels of vibration, and 16 levels of shock stimulation. The rubber covers placed over the receiver helps to ensure it doesn’t become damaged over time, or rub against your dog’s skin. While this training collar and many others are advertised as waterproof, exercise caution. 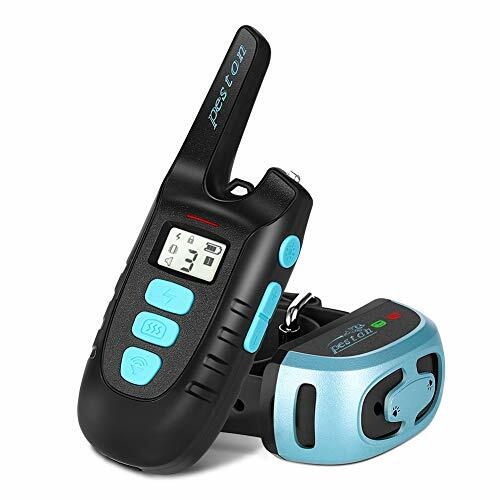 The BESTHING small dog training collar very well may be fully capable of being used at the lake or the beach, but it’s not usually recommended to submerge any type of electrical device. Rain, sleet or shine, the PESTON each small dog training collar has been submerged for 10 hours to ensure that there is no electrical mishaps. Working for canines weighing anywhere from 15 to 100 pounds, this collar makes a major difference in excessive barking, especially young puppies. Aside from the collar itself having problems remaining latched, there aren’t any serious safety concerns related to the PESTON small dog training collar. With a bright yellow stripe that gives owner a clear view of their dogs in darker settings, the Bousnic dog training collar could be especially useful when you’re camping or exploring exciting new places. While it certainly comes in small sizes, this collar also fits canine necks up to 27 inches! 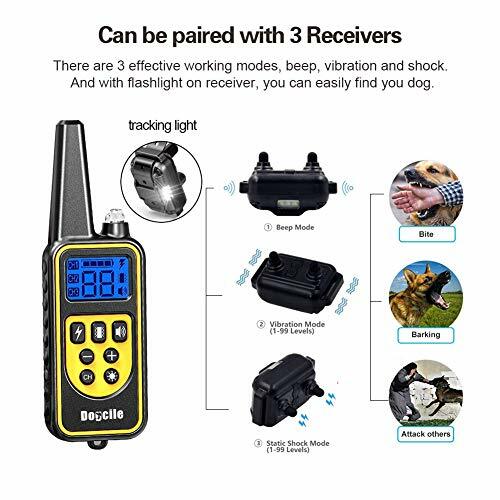 Now you can get a collar for both your German Shepard, your Pomeranian, and do some obedience training together thanks to the double transmitter! Not all training collar remotes are able to send a signal through walls, but the Ysince Tech dog training collar allows you to control your dog from the next room over. Aside from a few models having defective batteries, neither the collar nor the remote control have had any negative feedback as far as causing harm to your pet. If you’ve ever seen an older remote, you know there isn’t much to tell you what level your collar is on other than the buttons. Thankfully, brands like Ysince have upgraded their small dog training collars to contain LED screens. This helps with accuracy, and a brighter screen is helpful for pet owners who might have vision impairment. At this point, you should feel relatively comfortable making a decision on which one you want, so what are you waiting for? 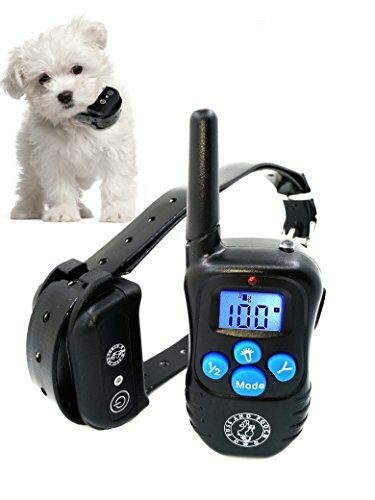 Out of all the options available on this particular list, the BESTHING dog training collar has to be the most reputable. When placed in comparison to others, it’s the safest one considering how little defects have been reported by users. It’s definitely a favorite among outdoorsy pet parents because they can let their dog roam free safely, knowing that the beep will bring their pup back round should they wander too far. A loose collar is something that can be adjusted, and while no training collar is perfect, this one is the least likely to give you problems!